There's a huge party on the walls of Québec ! The accordion is starting to play lively melodies in the heart of the city, and the whole town is invited to come and dance ! Viens-t'en ma blonde allez à soir c'est l'parté ! Y-a tout plein d'beau monde sur les ramparts un peu pactés ! Come over here my sweetheart, huge party tonight ! There's lots of good people, a bit drunk, dancing of the walls ! And the historical figures of Québec also cannot resist the sound of drums and flutes, they're off to mingle with the masses, holding hands and skipping to the music. All the famed characters of Québec's past, they're here joining in! Lieutenant-Général Montcalm is there, Lord Dufferin as lively as always, Price the architect enjoying the view and of course, the explorer Jacques Cartier, here before everyone else, but still very much around ! The commotion is a-goin' on atop the steep stairs of the "break-neck stairs" or "Escalier Casse-cou", just above the most European of streets in North America. Y'a Montcalm qui perd le sien ! There's Montcalm who's losing his calm ! Unfortunately for the French, things didn't turn out too well in the XVIIIth Century in Nouvelle Franse. 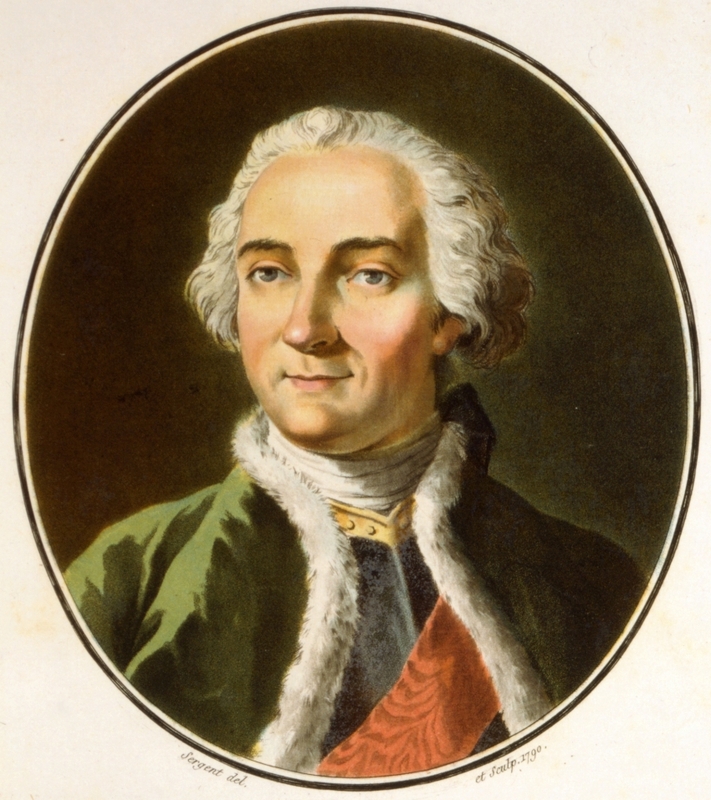 Brigadier General Louis-Joseph de Montcalm was sent to Canada by the French crown, having already fought in two wars in Europe. Here in New France, during the seven year war (1756-1763), he lead the line against the English, winning quite a few important battles along the way. "That way I won't have to see the English in Québec" he told the surgeon's brother. Y a un lord qui ronge du frein (Dufferin) ! There's a lord with the bit between his teeth ! This play on words is a bit tricky, so bare with me. "Ronger [du] frein", to chew a brake, in French, means to be eager to get going. And this Lord "Dufferin" ('du frein') sounds like "Lord of the brake" in French. Hence why this is hilarious. Mainly because Lord Dufferin had a very exciting life. This charismatic Englishman, Frederick Hamilton-Temple-Blackwood had a career as long as his name in Lebanon, Turkey, India... Sent to Canada by the English as Governor General in 1872, he actively oversaw a period of rapid change, politically, and economically. Always at the ready to meet the locals, help the disadvantaged, and see things first hand, he was also a most charming presence in high society, as that facial hair-trimming indicates. 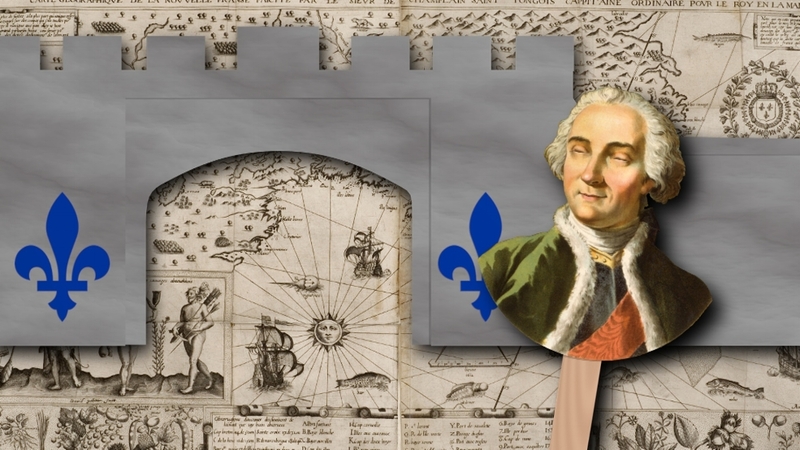 He was actually responsible for saving the old Québec city walls from destruction when they started to get hacked down by the council, and even persuaded them to rebuild what they had destroyed. No walls, no party, so thanks where thanks are due. 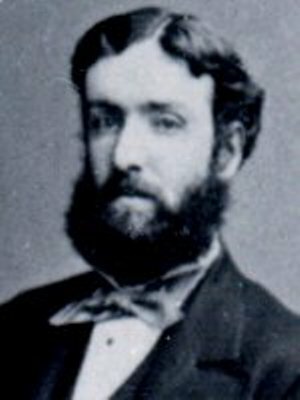 Fun fact about Frederick, as a young man, he published his witty and successful journal of a cold adventure up North, mainly through Iceland: "Letters from High Latitudes". An eager adventure, Going North, does that ring a bell? Y a un Price qui dessine bien ! There's a Price who draws well ! Unmissable, in the heart of the city, sitting atop the hill of the old town, the Château Frontenac peers over the celebrations. The architect of this famous Québec landmark too, has joined in with the fun below ! The train companies at the end of the 1800s were building lavish beautiful hotels to advertise train travel. And Bruce Price, an American, was chosen to build the one in Québec after having drawn up the train station of Montréal. Very inspired by the location and in the style of the fortifications built by Lord Dufferin, Price devised the unmistakable landmark. Inaugurated in 1892, the big central tower was however only added a three decades later. Et Jacques Cartier qui se souviens ! And Jacques Cartier who does remember ! 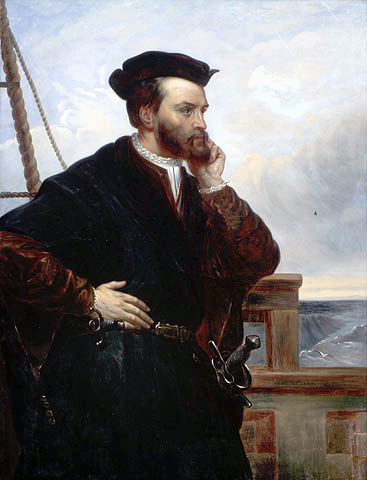 Jacques Cartier, remembering his discovery of Québec. Not his actual real face, of which no pictures remain. "Je me souviens" I remember- the official motto of Québec and a sentence you will see on every car, and, everywhere really. The region has come a long way since Montcalm was defeated by the Brits, with Lord Dufferin, and new buildings making up the identity of the city. Still, the French speaking population remembers, they were founded by the French crown. On the animated grey walls of the Québec as in their hearts, lies the blue fleur-de-lis, symbol of the King of France. Jacques Cartier, sailor from Saint-Malo in France, is sent in 1532 by François the 1st, King of France to find a path to Asia through North America. 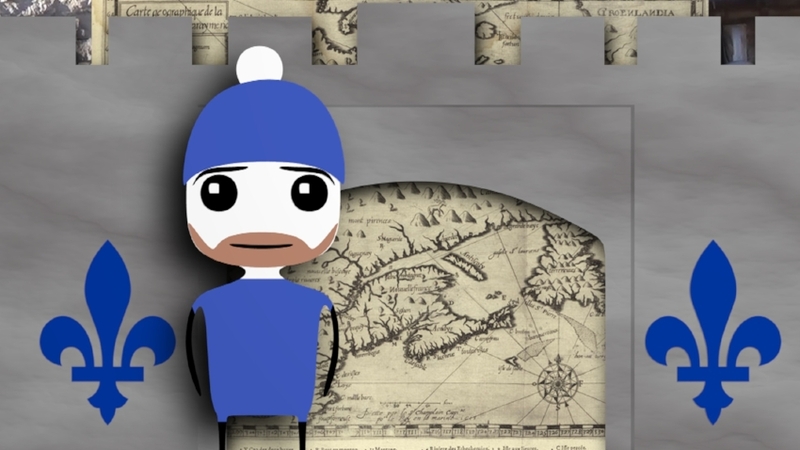 Despite there being quite a walk to the Pacific, Jacques Cartier was funded to travel three times to Canadas (which means in the native's tongue: bunch of huts). Not too much came of the excursions of Jacques Cartier, but it is the first foot of the French Monarchy in Nouvelle Franse. Only with Samuel de Champlain are then larger viable colonies established. Samuel doesn't feature here, but his maps do in the background ! And it's possible he got his song already. The dancing cultural and ukulele-ed adventure Ukulele Road Trips tips its hat for your support! You can become a Dufferin of kindness and encourage the discoveries and melodies of this site on the Ukulele Road Trips Patreon Page. #GoingNorth through the cool breezes of Québec is made possible with the help of Cloud Music Ukuleles whose website you can visit for quality cold-resistant ukes and gear ! Sometimes, no matter how musical you feel, and how much you're used to walking/singing around with your uke in hand, the cold wins; "it's far too freezing to play ukulele". That's definitely the case in Rimouski, by the icy banks of the gusty St Laurent River in Québec. Not only is it far colder than what you imagine the coldest place on the planet feels like, but snow storms might just suprise you at any moment. However, for the diehard bard, there's a workaround. "Just put your gloves on, that will do quite nicely". It's impossible to train your fingers to resist the harsh cold winds of North-Western Gaspesia "... they'll turn blue and surely fall off before the second refrain". Much more realistic is to train yourself to play with skiing gloves. "Just major chords here in Rimouski", because due to the super-complicated technique - sticking out one single finger on the left hand and just moving up and down the ukulele - you can only play major chords. Except for an A (minor) "But it's okay it's not that tricky anyway". When it's below 0 degrees Kelvin, as it is, most Winters on the beaches here, you don't sit around inside complaining anyway. You (snow-)suit up, get out there, and leave the whining and the minor chords to people in warmer climates. The other side of the camera on the banks of le Saint Laurent. A wild ukulele huddles in the grass nearby. The wider point being, I guess, that "boredom is a luxury, like memes that say 'oh FML!' and a suite of minor chords, but in the North", well, as some locals mentioned to me, you just get on with it, really. And if in other countries, you'd stay home because of a temperature half this cold outside, here, you deal with it and go out anyway, otherwise you'll never step outdoors ever again. If you want to learn more about the town of Rimouski from the locals, head over to the Rimouski Ukulele Road Trips podcast! [coming soon-ish]. It's got two locals, exactly as many jokes, and songs too. Une soupe au "Bercail" ! That's at the cool co-op near the Cathedral, in case you're just on your way through the cold winds to the center of town too. No need to be too fanatical and brave, and after a sing-along on the freezing beaches, a warm onion soup is a most comforting treat. Speaking of warm comfort, you can support the trip over on the Patreon, which is a bit like showing appreciation with thumbs up, except on Patreon, it's not only nice, it's useful. The #GoingNorth adventure is made possible with a helping string from the folks at Cloud Music ukuleles whose ukes withstand pretty low temperatures quite well as it turns out. Welcome to Québec, musical travellers ! It's in Québec, the Region, and in Québec, the city, that these Ukuleles have landed to kick start their big Northern Adventure. Technically, they landed a bit West of the capital of French speaking Canada, and then drove up a bit. But the more dramatic part of the arrival was the end of the flight itself: flying over the coast of Greenland. A fitting introduction, considering the theme of this particular adventure (#goingNorth, remember?). Introductions taken care of, the heart of the stay in Québec for my two stringed companions, is taking part in the Uke Fest du Nord, the most Northern Ukulele festival of the globe! 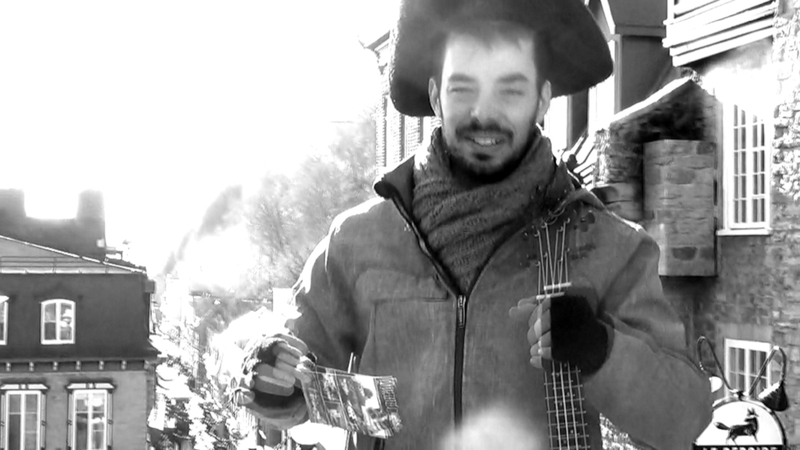 It could seem unusual to have a French-English musician sing an original song about the charm of Ukrainian City Lviv's old walls in French-Canadian Québec. And it is unusual, actually. Good point. But it is also fitting. Much of Québec's history is hidden inside of its historical city walls, high up in the "haute-ville". The only remaining city walls North of Mexico! And this you may know already, if you've had the pleasure if joining André and these ukes for the Québec Podcast! Guest André, who is, as you will hear, knowledgeable on all matters Québecoises, is the founder of the Ukulele club of Québec, of the Uke Fest du Nord, and also of the most Northern ukulele club of the known Universe, all the way up in Inuit land! Having been assigned many months in the most Northern reaches of the Québec region, he decided to import his passion for music&ukes up there too. You can read more about that in the printed annual review-Magazine of the Iniuit villages. Only thing is, you have to fly up there to get your hands on one. Your best move is probably to just let André tell you about it in the Podcast. 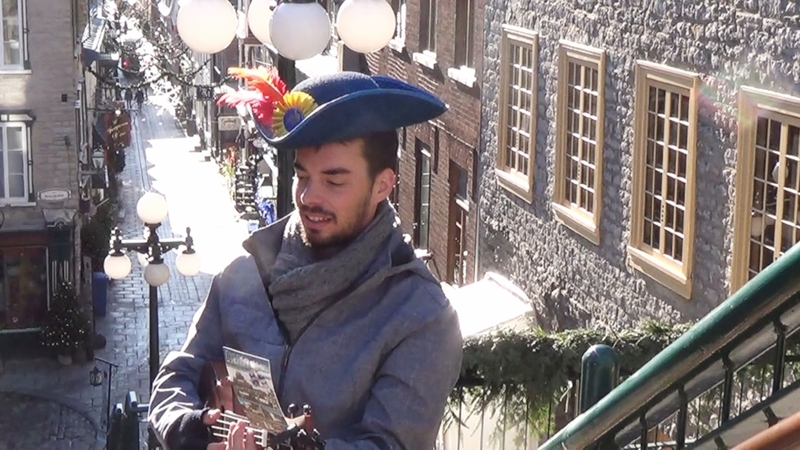 So it's in and around Québec's old walls, music and ukuleles flying peacefully around, that the adventure does start. So it's in and around the walls of this (relatively) old fortress that the adventure starts, as the notes and ukuleles float calmly around the Winter air. We're Off ! Woooo! And you can get a postcard from uz on the go! True story. I doodle on them between writing songs and gazing at river banks.